The Earth's climate is changing. The Humanity is afraid. But the Earth isn't the center of the Universe, but only a small part of the cosmic reality. The anticyclone vortex - which formed in the stratosphere, that is low pressure zone - hasabout 62,000 km of diameter, almost a quarter of the circumference of Saturn. 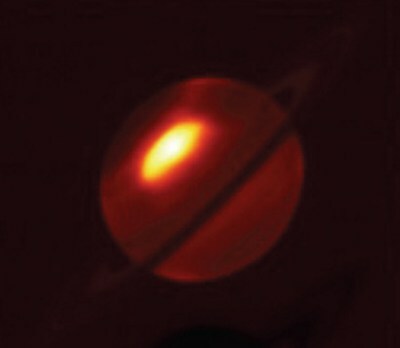 IMAGE: VLT mid-infrared image of Saturn's giant vortex, em 20/07/2011. Leigh N.Fletcher, University of Oxford, UK, and ESO. Global warming is a controversial subject and, while reality is shrouded in contradictions.Scholars divide opinions. The so-called global warming deniers, contest, specifically, the antropogêncio warming - caused by man. They argue that climate change is not related to human activities but with a process that is affecting the entire solar system. Among scholars, there aren't consensus nor about the warming. Some say that the temperature is increasing, others, affirm that is decreasing, in a process of cooling. Many denounce that the theory of anthropogenic warming is a theory forged by the more developed nations of the world with the goal of implementing a global tax on carbon emissions, what would keep rising powers limited in their development by this artifice, that would be a brake for economic growth. But the facts are indifferent to the discussions. And the fact is that the astronomical data indicate climate changes throughout the solar system. Two recent examples illustrate the phenomenon. SATURN - One Saturn's year equals 30 Earth years. The annual storm on that planet, which has been registered since 2010 but has started in August 2009 must lasts about seven Earth years. It is monstrous. The "Great Storm of Saturn's Spring" has manifested itself two years ago as a giant vortex, formed by the merger of two large pockets of hot air. This vortex moves across the northern hemisphere of the planet since mid-2011. Scientists Goddard Spaceflight Center (NASA), in the edition of November 20 (2011) of the Astrophysical Journal, describe an unprecedented energy emission. Moreover, scientists of Goddard Spaceflight Center (NASA), Greenbelt (USA, Maryland) - detected a large increase in the amount of ethylene gas whose origin is a mystery. URANUS - At Uranus, the study of an international team of scientists has revealed that currently the planet is swept by wind gusts reaching speeds exceeding 900 miles per hour. The finding surprised because when the Voyager probe passed by Uranus in 1986 showed a quiet landscape, without major changes. By our knowledge, these planets are not inhabited. If the climate can change at Jupiter, Saturn, Uranus due to natural causes, why not at the Earth? "dirt collects at the interfaces"
If the climate can change at Jupiter, Saturn, Uranus due to natural causes, why not at the Earth? it is. The issue is that humans are forcing it faster than would occur naturally. Okay, lets just pretend that your hypothesis is correct. How can you say the entire solar system is warming, when you only name 3 bodies out of 100's?